Docker is an application that makes it simple and easy to run application processes in a container, which are like virtual machines, only more portable, more resource-friendly, and more dependent on the host operating system. For a detailed introduction to the different components of a Docker container, check out The Docker Ecosystem: An Introduction to Common Components. There are two methods for installing Docker on CentOS 7. One method involves installing it on an existing installation of the operating system. The other involves spinning up a server with a tool called Docker Machine that auto-installs Docker on it. In this tutorial, you'll learn how to install and use it on an existing installation of CentOS 7. Non-root user with sudo privileges. A CentOS 7 server set up using Initial Setup Guide for CentOS 7 explains how to set this up. Note: Docker requires a 64-bit version of CentOS 7 as well as a kernel version equal to or greater than 3.10. The default 64-bit CentOS 7 Droplet meets these requirements. All the commands in this tutorial should be run as a non-root user. If root access is required for the command, it will be preceded by sudo. Initial Setup Guide for CentOS 7 explains how to add users and give them sudo access. The Docker installation package available in the official CentOS 7 repository may not be the latest version. To get the latest and greatest version, install Docker from the official Docker repository. This section shows you how to do just that. You will need to log out of the Droplet and back in as the same user to enable this change. The rest of this article assumes you are running the docker command as a user in the docker user group. If you choose not to, please prepend the commands with sudo. Docker containers are run from Docker images. 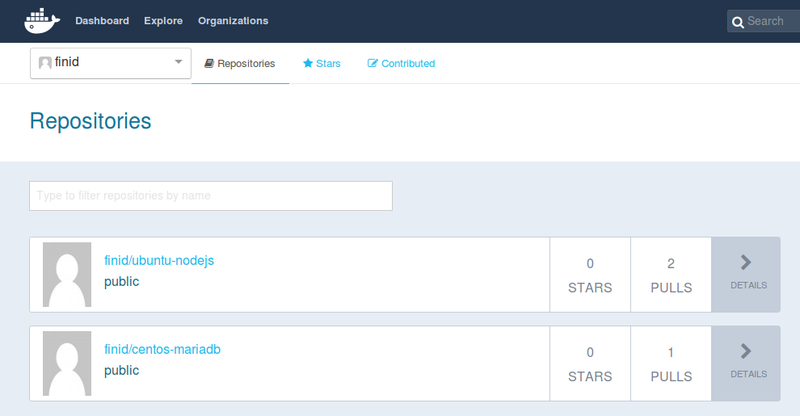 By default, it pulls these images from Docker Hub, a Docker registry managed by Docker, the company behind the Docker project. Anybody can build and host their Docker images on Docker Hub, so most applications and Linux distributions you'll need to run Docker containers have images that are hosted on Docker Hub. The hello-world container you ran in the previous step is an example of a container that runs and exits, after emitting a test message. Containers, however, can be much more useful than that, and they can be interactive. After all, they are similar to virtual machines, only more resource-friendly. Important: Note the container id in the command prompt. In the above example, it is 59839a1b7de2. After installing MariaDB server inside the CentOS container, you now have a container running off an image, but the container is different from the image you used to create it. Note: When you commit an image, the new image is saved locally, that is, on your computer. Later in this tutorial, you'll learn how to push an image to a Docker registry like Docker Hub so that it may be assessed and used by you and others. In the above example, centos-mariadb is the new image, which was derived from the existing CentOS image from Docker Hub. The size difference reflects the changes that were made. And in this example, the change was that MariaDB server was installed. So next time you need to run a container using CentOS with MariaDB server pre-installed, you can just use the new image. Images may also be built from what's called a Dockerfile. But that's a very involved process that's well outside the scope of this article. We'll explore that in a future article. The container-id can be found in the output from the docker ps command. This section shows you how to push a Docker image to Docker Hub. Log in, then repeat the push attempt. There's a whole lot more to Docker than has been given in this article, but this should be enough to getting you started working with it on CentOS 7. Like most open source projects, Docker is built from a fast-developing codebase, so make a habit of visiting the project's blog page for the latest information. Also check out the other Docker tutorials in the DO Community.